This product meets our criteria for natural because it is made primarily of natural ingredients with minimal processing. Natural ingredients are extracted directly from plants or animals as opposed to being made synthetically.Made from grass-fed USA beef and basted in a natural chicken flavor, rawhide provides a delicious way to help keep your dog's teeth and gums clean. Rawhide is also a great solution aggressive chewers, or puppies that are inclined to chew on shoes, furniture, or anything they can find. Plus, they make great fetch toys. Many rawhides are sourced in the USA, but processed overseas. 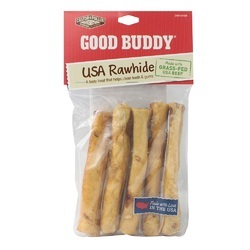 All Good Buddy rawhide is made in the USA from start to finish. That's their rawhide guarantee.Special Instructions: Coating is water-soluble and may stain indoor material. Wash hands with warm water and soap after handling.